The goal of LBS educational programs is to instill in youth a sense of workmanship and pride, foster a passion that will further the mission of LBS, and cultivate the next generation of stewards of our maritime heritage. All LBS educational programs integrate STEAM (Science & Technology, interpreted through Engineering & the Arts, based in Mathematical elements) goals. School programs can be customized to fit specific school curricula. Educational programming is ongoing and follows the academic schedule of area public and private schools. Those who garner an interest in the history and the craft of boat building have the opportunity to become apprentices or take part in other LBS educational offerings. Established as an adjunct and introduction to the Apprentice Program, the General Education Program provides a maritime history curriculum to local public and private schools and dedicates two to three days a week to hosting school groups of 100 or more students. 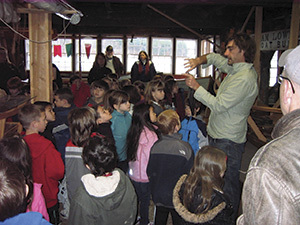 Students are introduced to the boat building process through “The Dory Story” and learn various STEAM lessons in hands-on workshops while appreciating the historic setting that inspires learning. Popular topics include the history of fishing and whaling, interpreting maps and charts, and improving the river’s ecology. Classes can schedule a single visit or a series of visits for in-depth learning. Implementing elements of the Apprentice and Math on the River Programs and incorporating STEAM goals, the Model Dory Program is designed to bring the experience and lessons of boat building into the classroom. Students take an authentic boat plan and use fractions and ratios to reduce the plan to a 1:8 scale. The students then further exercise their math skills to lay out the scaled down plan to produce the various pieces of the 1:8 scale model. In the final step, the pieces of the boat are assembled to produce an accurate scale model of a full-size boat. Additional learning experiences can include doing capacity and buoyancy calculations and adding propulsion to the boat. During four one-hour sessions, LBS staff brings materials and tools to the classroom for up to 25 students to design, measure, and construct a model boat. The Model Boat Program is available to area schools and can be adapted for grades 5-12. In response to the age-old question “When will we ever use this?,” LBS formed a partnership with Amesbury High School to develop and implement the Math on the River Program. In this innovative high school math program, students experience practical, hands-on applications of math beyond the classroom. 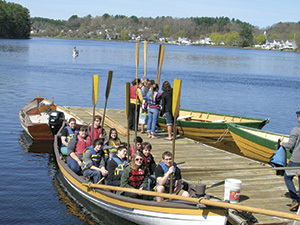 Students first learn to row as a team and to use sextants and other navigational tools; they then apply their knowledge of algebra, geometry, and trigonometry to determine the Merrimack River’s velocity, depth, distances, or tidal variations. In doing so, these hands-on, place-based activities further develop skills such as data gathering, variability analysis, and teamwork. This program inspired a student to comment, “What math class anywhere in the world is doing something as awesome as this?” Math classes can schedule a day long visit or a series of shorter visits. 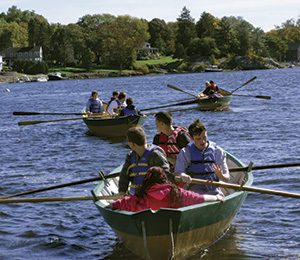 Under the direction of experienced and certified instructors, participants between the ages of 9 and 14 are taught traditional rowing commands, how to plan a trip on the water, basic marine safety, basic navigation, teamwork, and how to appreciate the nature, wildlife, and history that surrounds them. Geared toward teaching proficiency on the water, self-reliance, and confidence, youth programs are one-week summer sessions. In the spring and fall, rowing programs are available to school groups and can be customized accordingly. Please contact LBS for further information and fees.